Black Dragon 3-Piece Sword Set | BUDK.com - Knives & Swords At The Lowest Prices! 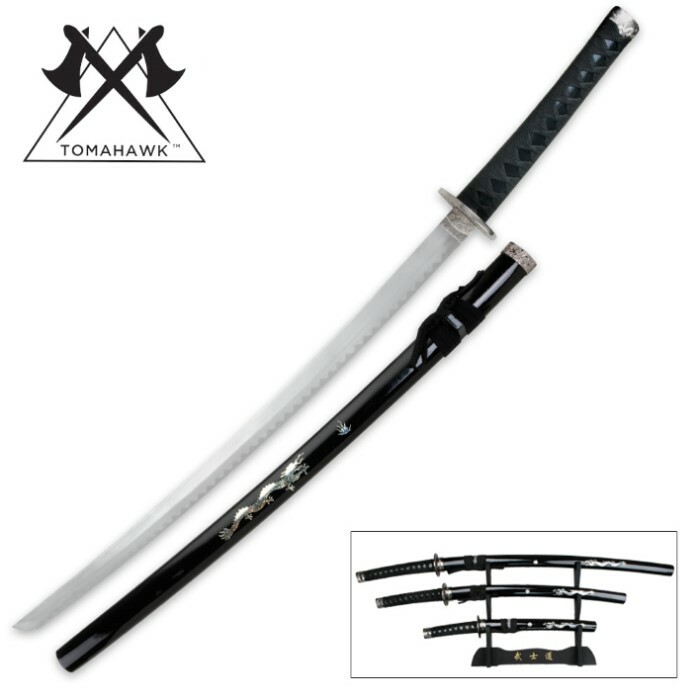 This is the ultimate samurai weapon collection for the true warrior soul! This set puts the beautiful weapons of a Japanese samurai right into your very own hands! The collection features a katana, wakizashi and tanto, each with a traditional pattern blade crafted from carbon steel. 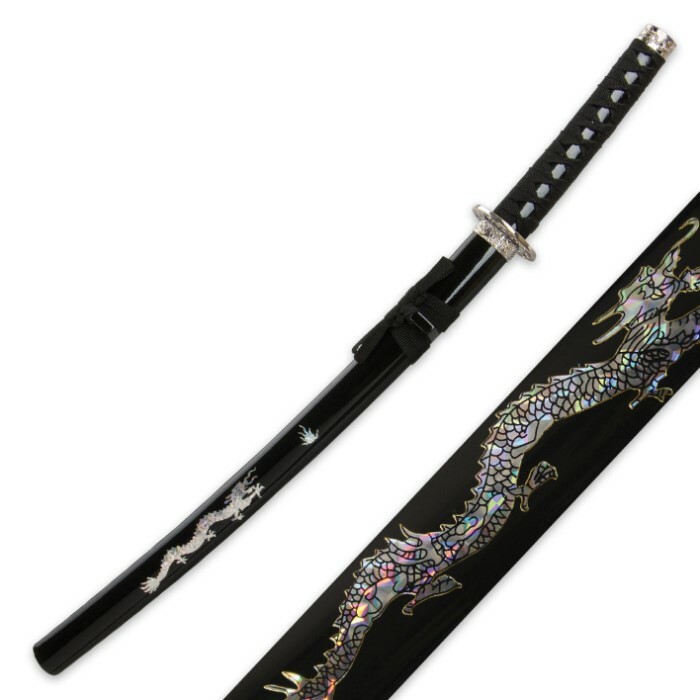 Each item offers an authentic-style handle with cord-wrapped hilt and ornate menuki and tsuba. The sheath for each blade is splendidly accented with a mother-of-pearl dragon design that highlights this outstanding collection. This set includes a wood display stand to show off the complete set. Got this set for $25 as a steal of the day and with a few other items, free shipping !! No better deal out there. Stand sets up in seconds and all put together the set looks amazing. Another review complains of quality but $25 vs many $100's made me think these might be for display rather than combat, maybe it's just me ?? I'm impressed by the quality for the price and if I do any damage to them, it will be my own fault for bringing knives to a gun fight !! I just got this set for Christmas and began going through a practice routine when I noticed that the blade of the Katana was VERY loose. Just from the use of the swords I've had in the past I knew that if I made an actual strike the blade would break free of the hilt. Now I will admit that I am hard on my weapons but the swords these were replacing I had for almost seven years without any problems and these swords I've had less then 12 hours before I noticed problems. Very disappointed and now I need to find a way to tell my mother that she got ripped off. Absolutely beautiful set!! No way could you find a better set for this price! I had my wife find a place for them while I was at work and she loved them so much she put them as the center piece on our fireplace in the living room.